Fund will provide infrastructure improvements, other incentives to attract economic development projects in Cleco’s 23 parish territory. PINEVILLE, La. – May 10, 2017 – Today, Cleco executives Peggy Scott and Bill Fontenot presented Gov. Jon Bel Edwards with $7 million for a fund that will be administered by Louisiana Economic Development to attract significant job-creating projects across the electric utility’s 23 parish service area in Louisiana. 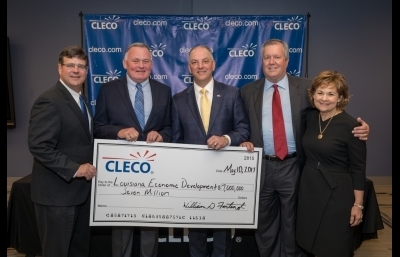 Scott, who serves as chair of the Cleco Corporate Holdings LLC board of directors, and Fontenot, the CEO of Cleco Power LLC, presented a ceremonial check for the $7 million fund, which represents one of the key commitments made by a group of investors who purchased Cleco last year. The investor group – led by Macquarie Infrastructure and Real Assets, British Columbia Investment Management Corporation and Jogn Hancock Financial – completed the purchase in April 2016 following the March 2016 approval of the Cleco sale by the Louisiana Public Service Commission. Cleco’s 23-parish region stretches from St. Mary Parish in the coastal Bayou Region of Louisiana through Acadiana, Southwest Louisiana, Central Louisiana and into DeSoto Parish in Northwest Louisiana. The service area also includes St. Tammany Parish and parts of Tangipahoa and Washington Parish in Southeast Louisiana. In all, Cleco provides electrical power to approximately 288,000 commercial and residential customers.